As a general matter, historians tell the stories of great men (and sometimes women) and the events that made them prominent. In doing so, they follow well-established conventions: Who were their parents and where did they grow up? What did they do that made them noteworthy? How did they die? Occasionally, we learn something about their daily lives, but that is ancillary to the main narrative. These established historical protocols provide examples of lives well lived. Of course, the literature also includes the tales of rogues and scoundrels. In either case, readers will discover good examples to follow and bad models to avoid. 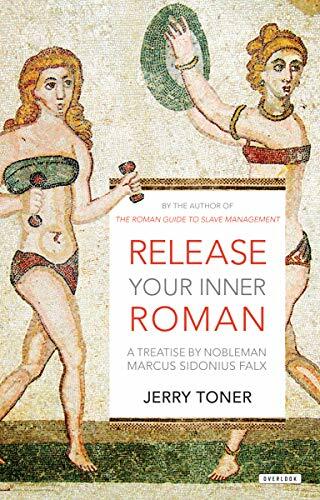 On occasion, historians adopt a very different approach, but rarely as distinctive as Professor Jerry Toner in his didactic essay Release Your Inner Roman: A Treatise by Marcus Sidonius Falx. Professor Toner is a Fellow and Director of Studies in Classics at Churchill College, Cambridge. His “voice” for this study of ancient Roman life is the fictional noblemen Marcus Sidonius Falx. The result is a unique and intriguing look at daily life in Rome. Toner’s work is filled with directives about how Roman noblemen should conduct their own lives and manage the lives of their wives, mistresses, children, and anyone else who comes in contact with these odious principals. Life for the Roman aristocrat is filled with the pursuit of glory, especially if he already has enough money to live a life of leisure. The head of the household ruled his domain much as the emperor ruled his people. Any student of ancient history knows of the successes of the Roman legions in conquering lesser tribes in the known world. What Falx teaches is that these triumphs began at home with training in discipline and a full measure of personal courage. The economy of ancient Roman rested on two stella (or stools). Triumphs on the battlefield produced substantial bounty. They also brought new supplies of slaves to Rome. With wealth and slaves, the nobility flourished for centuries. Falx was not benevolent in his pronouncements about the treatment of wives, although his dicta might have seemed matter of fact to any Victorian. A woman’s role was to marry whomever her father determined suitable and present an adequate dowry to her intended. A wife’s major goal in life was to produce a male heir. In fact, when Falx’s spouse failed to produce any children, she offered to divorce her husband so that he might marry someone who could produce a son. Additionally, she offered to stay in the household and raise the child. Falx’s assertions are contained in nine chapters, setting forth the rules on managing one’s family and emotions, pursuing happiness, and maintaining health. At the conclusion of each chapter, Toner includes a few pages of notations including the ancient resources for the gospel that Falx has dictated. The text ends with a chapter on further readings. In all, Toner’s tome is marvelous. It shows an experienced pedagogue at work. Undergraduate students expect to receive lectures from imperious professors, but not from nobleman Marcus Sidonius Falx. Were Professor Toner to don the appropriate toga and lecture his classics’ students at Cambridge, the novices will be filled with both elation and joviality. This would be an achievement worthy of a laurel wreath.